The Center for New Mexico Archaeology (CNMA), a facility of the Museum of Indian Arts & Culture, is intended to serve as a central resource for archaeological research, curation, and education in New Mexico. 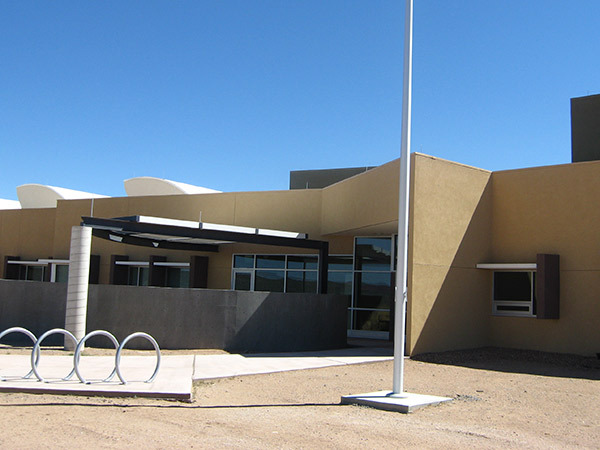 The Archaeological Repository at the CNMA incorporates state-of-the-art climate control and fire suppression, ensuring a safe, secure, controlled environment for New Mexico's unique and irreplaceable archaeological heritage, including nearly 8 million artifacts from all time periods and cultures. The Archaeological Research Collection (ARC) of the Museum of Indian Arts and Culture and Laboratory of Anthropology are actively used for research and education by scholars, students, and artists. The Museum serves as the repository for archaeological material collected from lands owned by the State of New Mexico, and about half the collections are from state land, or have been donated to the Museum from private land. The other half of the collections are from federal or tribal lands, and the collections are managed by ARC on behalf of the client agencies. The major source of the collections is through Cultural Resource Management (CRM) investigations, and their growth of between 300-600 cubic feet per year reflects the pace of economic development in the state. The CNMA also houses the offices and labs of the Office of Archaeological Studies (OAS), which has provided not-for-profit cultural preservation and resource management services to state, federal, municipal, and private clients since 1952. Highly qualified staff provide a full range of archaeological services. The CNMA is located on a new 25-acre campus reserved for museum collections and services. Located southwest of Santa Fe, off Caja del Rio Road, the land for this campus was provided by the Bureau of Land Management (BLM) through a lease-transfer agreement, and will be patented to the state of New Mexico. This campus will serve as a locus for museum-collections care, conservation, exhibit fabrication, and education programs for the next 100 years, allowing the State museums in Santa Fe to focus the public face of their facilities (the downtown and Hill museums) on exhibitions and public programs. The campus was developed in collaboration with Santa Fe County and the CNMA is compatible with existing land use along the Caja del Rio Road corridor. County roads through the campus provide a utility corridor for the Buckman Diversion water systems, and the campus serves as a buffer and entrance for expected residential communities. Planning for the CNMA extended across nearly twenty years. Programming and schematic design for construction on the Museum Hill campus was undertaken in 1997. However, future expansion prospects were poor, and the development would have constrained the expansion potential of the existing museums. Planning resumed in 2003 with a search for a suitable new location. Land was available through the BLM under the Federal Recreation and Public Purposes Act, and the BLM has been a supportive and active partner for developing the CNMA and the museum campus concept from the beginning. In 2004, land evaluation was begun, and both CNMA and the campus were programmed. An architect's contract was awarded in 2005, and a schematic design was developed for the campus and the building. Construction acheived LEED Silver certification and was planned to accommodate phased growth over the next century. Both Native American representatives and Conservators from the Museum Resources Division of the New Mexico Department of Cultural Affairs have been closely involved in the planning and design of the Archaeological Repository wing of the CNMA. The Repository at the CNMA has been designed to provide not only a greatly improved storage conditions and preservation environment for the collections, but it will also allow all of the Museum’s archaeological collections to be centralized under one roof for the first time in more than 50 years. Few archaeological sites are excavated for purely research purposes today, and previously excavated collections in ARC are regularly reexamined for new insights into the past. Students and archaeologists from New Mexico and across the nation will be able to access the collections for research and training through our new 1,200 square foot Research Lab. Researchers who wish to visit the collections can follow the link for more information to find procedures for requesting access to archaeological collections. Through agreements with tribes and federal land managing agencies, as well as New Mexico state statutes, the Archaeological Repository of the Museum of Indian Arts & Culture is entrusted with protecting, preserving, and providing access to material culture removed from archaeological sites in New Mexico. Although the collections include artifacts and environmental samples from sites dating to the Spanish Colonial-era and homesteads settled in the early 20th century, ancestral Native American artifacts constitute the majority of the ARC collections. The Repository staff works with federal agencies and tribes in cooperative collection management, acting as an intermediary to ensure that their collections are available for exhibit, research and loans, and educational programming as deemed appropriate by the tribe or agency. The collections will remain accessible to our Native American constituency, including religious leaders who use the collections for the maintenance of traditional cultural beliefs and practices, and artists who use them to study traditional designs and methods of construction. The Repository collections include NAGPRA-sensitive materials, such as human remains and funerary objects. A special sensitive-materials room has been built at the CNMA, with input from Native American consultants, in order to respectfully hold these materials while awaiting tribal repatriation decisions. Archaeologists from throughout the state will have access to the expertise and specialty labs of the OAS, one of the oldest archaeological research organizations in the country. Animal bone identification, archaeomagnetic dating, plant-material identification, pottery analysis, and technology labs provide specialized services to clients and archaeologists throughout the Southwest. An architectural preservation laboratory will be reestablished in collaboration with the National Park Service, extending a program that was initiated in the 1980s. The OAS education outreach program, Roads to the Past, has existed since 1991 and was recognized in 2005 and in 2012 with the Excellence in Public Education Award by the Society for American Archaeology. More than 65,000 adults and students have been served by the program, including Native American communities. A privately funded education center is planned for the campus, which will allow OAS staff to conduct teacher training in the social sciences as well math and science enrichment courses.